Re-opening its doors after a few months under the knife, the newly nipped and tucked Sartoria is now suitably attired to accompany its suave neighbours on London’s Savile Row. Taking inspiration from the street’s tailoring history as well as the restaurant’s Italian heritage, designer David d’Almada has unfurled a handsome, romantic space in an elegant palette of creamy ivories, chivalrous oxbloods and rich walnuts, with hints of antique copper and nickel accents. 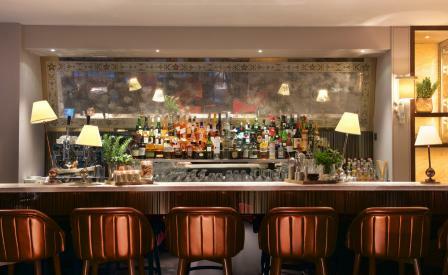 Squishy carpeting, enveloping chairs, cosy velvet and leather booths and tastefully dressed tables, make it the perfect spot to sample chef Francesco Mazzei’s menu, which - inspired by his native Calabria - is a rounded mix of meat-based dishes, fish and fresh vegetables. There is a new outdoor terrace, but we suggest starting off with a vermouth in the Libare Bar, before settling down to a satisfying plate of burrata with tomatoes, smoked aubergine and basil, followed by expertly prepared home cured baccalà marinated in liquorice. Not to forget dessert: relish the custardy marsala zabaglione, which poured from a extravagant copper pan at the table, adds a flash of drama to the meal.